What’s the point of having a structural engineer? Building is expensive. The recent financial crisis proved that construction is a luxury, because during hard times we can do without it. For many people, property is the most expensive outlay in their lives. So when it comes to embarking on an expensive building project it’s important to make sure every pound counts. So avoiding hiring a structural engineer may seem an easy saving. The Romans built all their great structures with an architect to provide the vision and experienced builders to make it stand up. What’s a structural engineer for? What’s the point of them? What you get with a structural engineer is someone who can – using a scientific approach – tell you exactly how much structure you need. One element of that is judging the strength of the structural frame. In order to design a structure that is strong enough without additional materials, which are wasteful and expensive. A brilliant demonstration of the potential of structural engineering came from a group of students a few years ago. They had to build a dome structure, 40cm high and hollow, with a kilo of spaghetti and some glue. The winners would be the group that supported the biggest weight with the least spaghetti. A common sense approach might be to use triangles to make the dome shape. To make it easy to build you might use the same size triangles throughout and estimate the strength by averaging out several different people’s opinions. A reasonable strength to achieve from a bag of spaghetti is hard to gauge, maybe a few kilograms is achievable. The engineering students in question, tested the spaghetti to calculate its material properties (how much force it could take and how much it bent for a certain amount of force). Instead of designing the whole dome as one unit, they approached it as a series of 10 arches, which combined together make a dome. Using some trigonometry they were able to work out the best shape for the arches. They then used some engineering software to check that there were no particular weak spots and that the whole structure would be working hard before any one part broke. 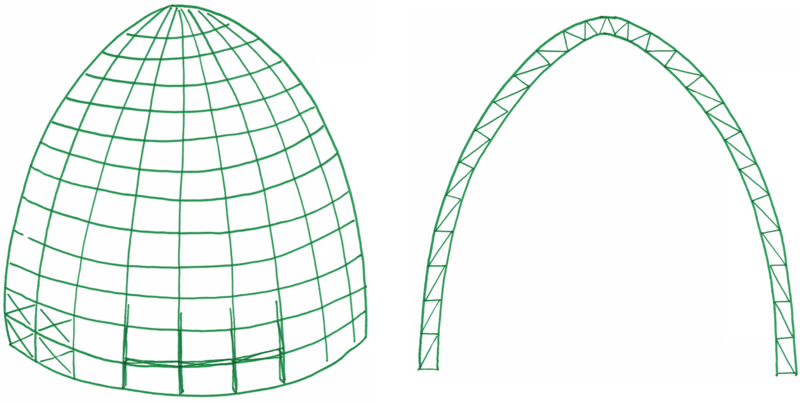 By separating the dome into 2D arches, they could build the dome flat and them assemble it, making it easier to build well. So what was the benefit of having a structural engineer? Well if a smart person had designed something and built it well, it might be expected to hold a few kilograms. The ‘engineered’ spaghetti dome held 195.5kg! Slightly more than the 190kg predicted. It performed so well that the engineering department had to bring in a new testing rig, as their first one only went up to 100kg. So what’s the point of having a structural engineer? Well a structural engineer helps you to get every ounce of strength out of the structure. So although their services cost money, they can design something which is easier to build and without additional materials, which are wasteful and expensive. If you speak German, you can read more about this example here.